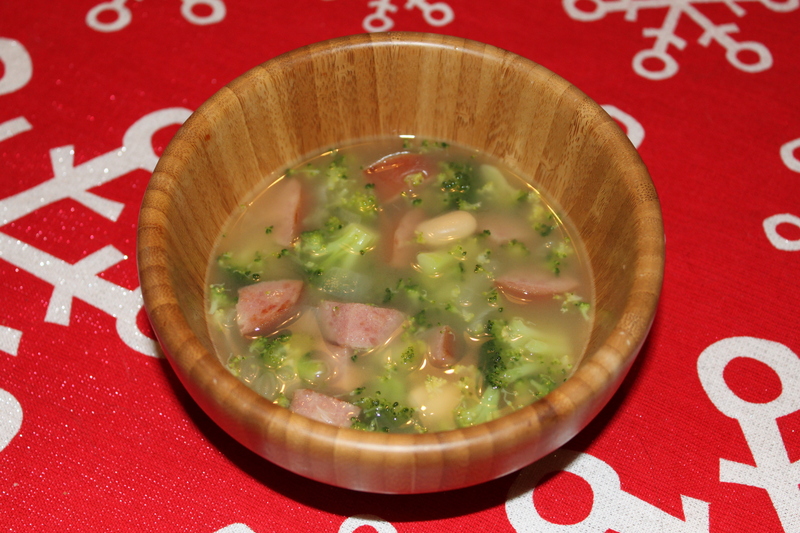 For us this was white bean, sausage and broccoli soup since I didn’t have any spinach! The recipe comes from the November 18, 2011 issue of “All You” magazine. 1 Warm olive oil over medium heat. Add sausage and cook, stirring, until browned all over, about 5 minutes. Transfer to a paper towel lined plate. Discard all but 1 tablespoon of fat from pot. Add onion and garlic and cook, stirring often, until soft, about 3 minutes. 2 Return sausage to pot and add chicken broth, 3 cups water and beans (I added the broccoli here too). Bring to a boil, reduce heat to low and simmer for 15 minutes. Stir in spinach until wilted, about 1 – 2 minutes. Season with salt and pepper.